At the end of July 2010, I took a pregnancy test. Two Lines! Yay! My husband and I were excited and nervous at the same time, as this was our first pregnancy. We set up the initial appointments and consultations. Two days before our initial appointment, I started bleeding. We figured it might just be implantation bleeding, so the doctors did an ultrasound. Though it would only be 5-6 weeks at this point, they didn’t see an embryo, and were concerned for possible ectopic (in the fallopian tube or ovary) pregnancy. They took 2 consecutive HCG (pregnancy hormone) tests, and the levels doubled as they should have. The next week at the ultrasound, they still didn’t see an embryo. The HCGs went up again, but since the HCGs did not double, the doctor ruled out ectopic pregnancy and said it was most likely miscarriage. The week after that, there still was no embryo and the doctor confirmed it was a miscarriage. The doctor said it would happen in a matter of days due to the amount of blood in my uterus. Fast forward three weeks: still no miscarriage. The doctor did another ultrasound and still no embryo was to be found. My HCGs had spiked through the roof and there was definitely something in my uterus. Based on the ultrasound, the doctors suspected it might be a molar pregnancy, a genetic abnormality beginning at conception that produces abnormal placenta-like cells that keep growing. Since there was no embryo, the doctors recommended a dilate & curettage (D&C) to remove the contents of my uterus. After the surgery, it was determined that I indeed had suffered from a Complete Molar Pregnancy, where the DNA in the egg either isn’t there or does not activate, but there is still DNA from the sperm, so the cells start dividing and growing anyway. The doctors were pleased at how well the outpatient surgery went and I went home to recuperate. Fast forward one week: my HCGs fell over 90%! Great news! Fast forward another week: my HCGs increased slightly. Bad news. This meant there could be some left-over abnormal cells still growing in my uterus. Doctors wanted to wait another week to be sure the HCG levels were on the rise again. Fast forward 4 days: heavy bleeding. The doctor told me to come in ASAP for blood work, exam and CT scan. They discovered more tissue in my uterus and confirmed my HCGs had nearly doubled from my last known level. They recommended against another D&C due to the uterus still healing from the last one. My CT scan results confirmed that it was not spreading, leaving me with the diagnosis of Gestational Trophoblastic Neoplasia, the invasive non-cancerous form of the disease. Because it was invasive into my uterus, this was obviously a concern that needed to be addressed right away. The silver lining in all of this is that these molar pregnancy cells are very vulnerable to chemotherapy. So, for the foreseeable future, I will be receiving methotrexate (mild chemotherapy) treatments every other week until my HCG hormone levels return to zero (non-pregnant). The doctors are confident of successful treatment and are optimistic for future fertility. After sufficient methotrexate treatments, my body will finally realize that it’s not a baby and will “deliver” the tissue. As you can imagine, this has been a very difficult few months. We are on the path to recovery, but it will be awhile before we can try again (HCG levels need to get to zero first and then stay there for at least 6 months). 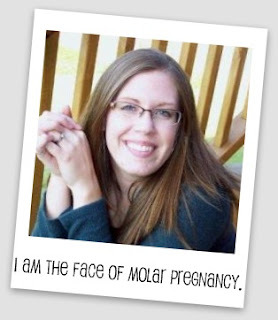 My heart goes out to all women who have suffered loss, especially to those suffering from molar pregnancy. I’ve started a dramatic blog to capture the experience and educate others on this devastating disease.